SANDAKAN: The Sabah Wildlife Department, Reef Guardian Sdn Bhd and Cardiff University recently signed a memorandum of understanding (MoU) to establish the Sugud Islands Marine Research Centre (SIMRC) on Billean Island, within the Sugud Islands Marine Conservation Area (SIMCA), on the east coast of Sabah. Assistant Tourism, Culture and Environment Minister Datuk Pang Yuk Ming, who witnessed the signing of the MoU, said that on December 3, 2001, the State Government of Sabah declared three islands comprising Lankayan, Tegaipil and Billean as well as surrounding coastal shallow reef areas of approximately 46,317 hectares as Sugud Islands Marine Conservation Area. “SIMCA has been playing for more than 12 years a key role in managing coral reef conservation for the long-term benefits of eco-tourism and the biodiversity of marine life. “Now, Reef Guardian that was appointed to fully manage SIMCA with close cooperation with Sabah Wildlife Department is embarking on a new initiative together with Cardiff University: the setting up of a marine research centre to enhance research and conservation of the marine ecosystem and scientifically assess the success of the conservation area. 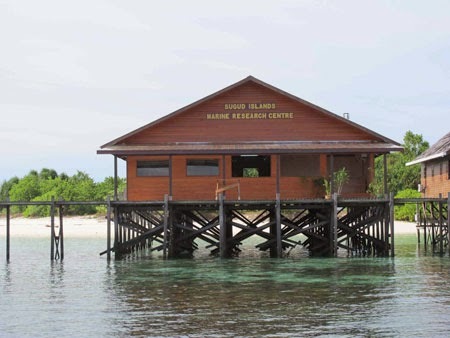 “I am extremely proud to be part of this initiative that will certainly increase the interest of local and international scientists for coral reef ecosystem research in the region, and will certainly boost eco-tourism in the east coast of Sabah,” he said. Davies Austin Spiji, research officer at Reef Guardian and manager of SIMRC, said the objectives of SIMRC are to enhance knowledge and skills on marine research and monitoring through joint training, workshops and research for effective management of marine resources and biodiversity conservation. “SIMRC will also provide training and teaching facilities to local and international universities and institutions for hand-on field experiences in tropical coral reef ecosystem,” added Davies. “Finally, SIMRC will facilitate restocking of commercially important and threatened marine species in Sabah region through mariculture practices and promote awareness on marine conservation to public and local stakeholders,” said Davies. Dr Benoit Goossens, director of Danau Girang Field Centre (DGFC) and Research Associate at Cardiff University, said the creation of the marine research centre in SIMCA will provide a world-class education and research facility with the necessary structure and resources to undertake advanced marine ecosystem science, particularly in small tropical island and coral reef ecology. He said Cardiff University will offer field courses to Malaysian students and to other local and international students to undertake training at SIMRC, will manage student intake and field work programme at the centre, and will help raising funds for the procurement of consumables and additional laboratory equipments and for research projects and conservation activities to be carried out at SIMRC and within SIMCA. “Today, Cardiff University is in a position to offer field courses and research opportunities in the two most diverse ecosystems of the world, tropical coral reef at SIMRC and tropical rainforest at DGFC in the Kinabatangan. For that, we would like to thank the Sabah State Government, the Sabah Wildlife Department and Reef Guardian for their support and frienship and we look forward to many years of collaboration,” added Goossens. Kenneth Chung, director of Reef Guardian; Roland Niun, Sabah Wildlife Department’s senior officer for Sandakan District, Jeffrey Hj Aman, secretary of Sandakan Municipal Council and Jufri Hj Nasri, officer in charge for Turtle Islands Park were also present at the signing ceremony.